Mark Zelich’s trademark “Courage” sign-off carried him through nearly twenty years as WSAU-TV’s sports anchor, which was the major part of his 43-year broadcast career. He began his career in 1951 with disc jockey and sorts announcing stints at WDBC-AM, Escanaba, Michigan and WATW-AM, Ashland. He moved to the Wausau/Merrill area in 1955 to be a sports reporter and play-by-play announcer for WOSA-AM/WLIN-FM. He moved to WSAU-TV/AM/FM in 1957 as a sports anchor and became the television station’s news and sports director in 1965. 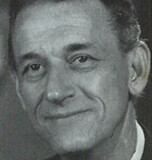 While doing local high school play-by-play, he served as the voice of Badger Football on Wisconsin Radio Network from 1959-1970. Zelich left his position as sports anchor in 1977 and remained at the renamed WSAW-TV as Vice President of News and Sports until his retirement in 1994. As a teenager growing up in central Wisconsin (Stevens Point) we watched Wausau Channel 7 daily and the source for our News and Sports was Mark Zelich. He was truly a favorite of mine to the point that after I left the military I attended the Trans American School of Broadcasting in Wausau. The unfortunate thing for me was I didn’t have the talent that Mark Zelich had so I had to alter my career goals. Even to this day I think of him on the news desk and think that it’d be nice if he’d come out of retirement and still do the News and Sports just one more time. Those of us that grew up with you really miss you Mark. Thank you for what you gave to us over your career. I had the honor to work for Z in the late 70s at Ch.7 as a sportscaster. Anyone that worked for this man knows how blessed we were! When Mark joined WSAU in 1957 as part of their news team I was 12 years old and living in Stevens Point. He was my hero. When I saw him do a Warsau a Lumberjack basketball game at PJ Jacobs High School in Stevens Point I thought I had seen a movie star. After all, I had been watching him regularly on that relatively new invention called TV. By The time I was 22 years old, I had already had some experience as a radio news man. Imagine my surprise when I was contacted by the general manager of WAOW TV, channel nine in Wausau about taking the job of sports director at that station. I was gob smacked! The idea of going head to head with Mark Zelich intimidated me beyond description. But I was young and I was extremely ambitious and so I took that job and held it for 18 months before moving on to WISN in Milwaukee and then 18 years at KTVI in St . Louis. Of course, Mark never knew this but he helped push me to polish my career. He set a high bar. I appreciated Mark while he was my news director at WSAU in Wausau. He offered a ton of insight in the newsroom. Thank you Mark for starting my television career! – Judi (Krall) Loomis. Judil@the-League.org.